The Free Stat System is a separate stat system that adds on to the character's fixed level bonus stats. 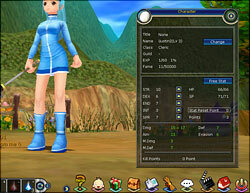 Players can customize their characters with the Free Stat System by using stats on different attributes of their characters. Initially, 1 Free Stat point is given to each character, and 1 Free Stat point is given at each level. Also, when a player completes a class upgrade for the first time, 5 Free Stat points are given. 10 Free stat points are given when the player completes the second class upgrade. To access your character info window, press the ‘C' key, or click on the icon at the bottom right corner of your screen. Stats for each attribute are displayed in the center of the Character Info window. The point that is displayed on the middle right corner can be invested in any desired attribute by pressing the triangle shaped button. More detailed information on Free Stats can be shown by pressing the Free Stat button.